Pack with three sets of strings. Gauges: 11-15-22-32-42-52. 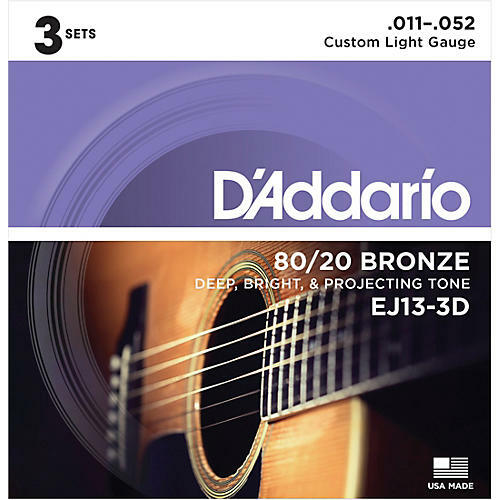 The D'Addario EJ13 acoustic guitar strings are an 80/20 Bronze version of D'Addario's popular EJ26 Phosphor Bronze Custom Light guitar strings. 80/20 Bronze, commonly referred to as brass, is the original acoustic string alloy selected by John D'Addario Sr. and John D'Angelico in the 1930s. 80/20 Bronze acoustic guitar strings are popular for recording due to their crisp, bold, and projecting tone and appeal to many traditionalists for their historical significance, unparalleled longevity, and vastly superior sound.